A professional skier will battle against two online gamers in the world's first interactive "mixed reality" downhill ski race using technology pioneered by European researchers. 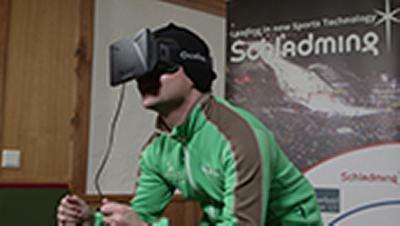 Hitting speeds of up to 100 kilometres an hour, the top-class skier will hurtle down the world cup ski course in Schladming, Austria, in a bid to reach the finish line before his two competitors – virtual reality gamers based in Thessaloniki, in Greece, and Munich, in Germany. The racers will use a 3D tele-immersion platform and wear new virtual reality technology - Oculus Rift - that allows them to compete against each other by racing down the same ski slope at the same time. The competition is the culmination of research by the European Commission funded 3D LIVE project. The project’s technical lead, Michael Boniface, Technical Director at the University of Southampton IT Innovation Centre, UK said: “The competitors will interact in real-time sharing their experience in a 3D virtual environment delivered over the Internet to wearable immersive devices. The consortium, which is made up of Collaborative Engineering, in Italy; University of Southampton IT Innovation Centre, in UK; the CERTH Information Technologies Institute, in Greece; Arts et Metiers ParisTech Laval, in France; Sportscurve, in Germany; and Cyberlighting, in Finland, has worked on the 3D LIVE project to deliver a mixed reality, immersive 3D platform where users can experience, feel and interact with real environments and distant users in real-time.